Are you interested in doing business in Sweden? Are you interested in taking a trip to Sweden? 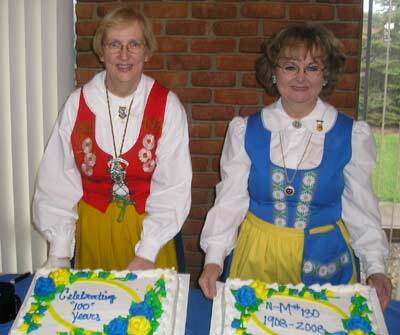 Are you of Swedish heritage and living, working or visiting Cleveland or Northeast Ohio? Submit your Cleveland Swedish news and events. How long does Sweidsh Christmas last? Swedes may be a little confused about when Christmas is actually over - but I suspect the tradition to make Christmas last a little longer has more to do with the desire to extend the enjoyment of the decorations, the festivities, and the lights in the darkness of winter. Indeed, with sunrise in Stockholm just before 9 AM and sunset at 3 PM at the end of December, who wouldn't like to have a little more light and warmth and cheer? 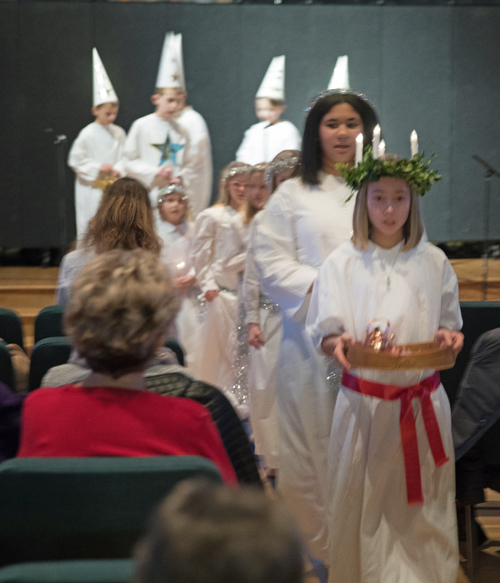 The Swedish Vasa community hosted a Swedish Lucia celebration on Saturday, December 8, at 4 p.m. at Church of the Saviour in Cleveland Heights. 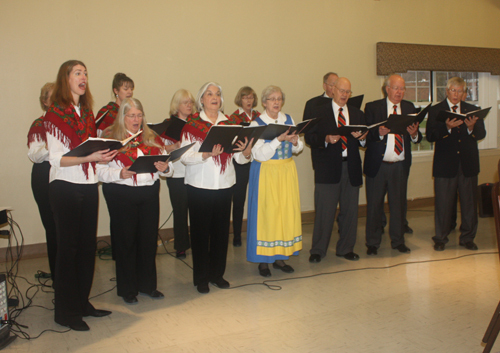 The program began with a winter concert of the Vasa Voices, directed by Judith Higbee, singing traditional winter and folk songs in Swedish. 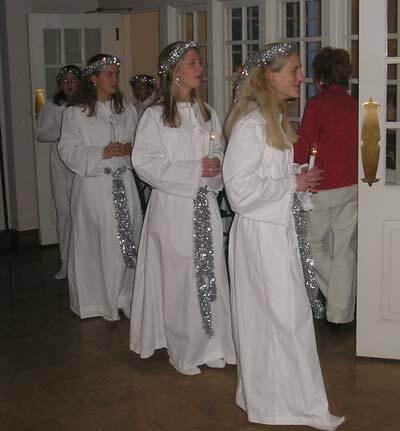 Following the vocal concert, the Lucia procession took place. 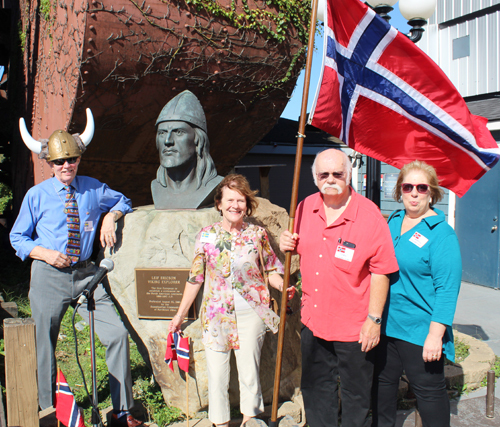 The Scandinavian community of Cleveland, including those from Norway, Sweden, Denmark and Iceland gathered at the bust of Leif Erikson in front of Shooters in Cleveland's Flats to celebrate Leif Erikson Day. 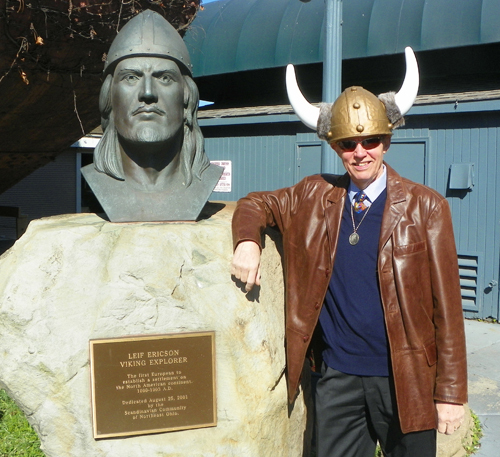 Leif Erikson was a Norse explorer regarded as the first European to land in North America (excluding Greenland), nearly 500 years before Christopher Columbus. 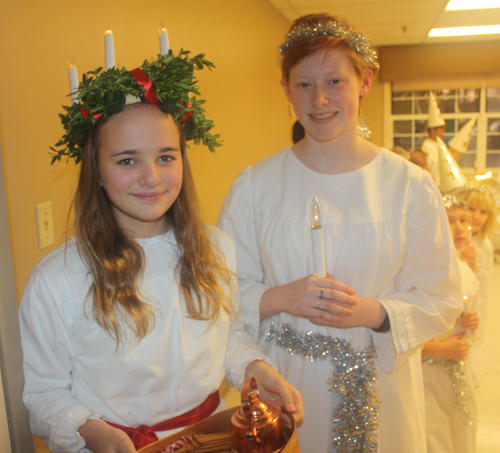 The Nobel-Monitor Lodge #130 Vasa Order of America hosted their annual Christmas and Lucia Fest on December 6, 2015. 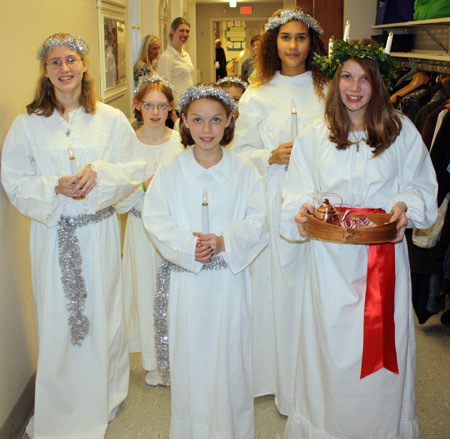 Highlights included the songs by the Vasa Voices Choir and the Lucia procession and songs by the children. The Vasa Voices Choir of Nobel-Monitor Lodge #130 Vasa Order of America performed at the 2015 Christmas and Lucia Fest in Highland Heights (Cleveland) Ohio. The Octoberfest events in Scandinavia are very popular, and not only among local beer lovers! 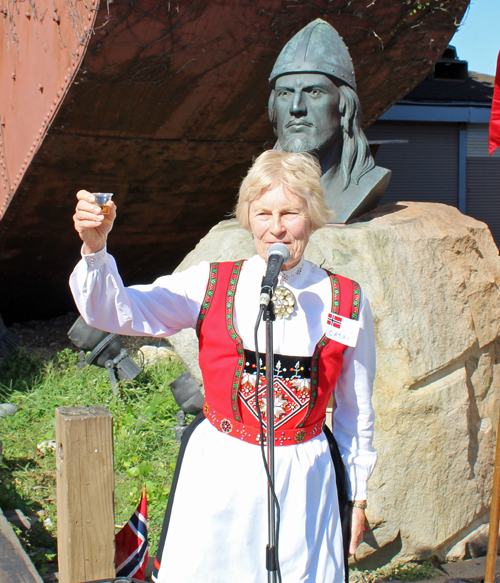 A Scandinavian Octoberfest is a great celebration when the warm weather diminishes in fall. Despite the name "Oktoberfest", most Oktoberfest events start in September. Quite a peculiar national tradition in Norway is solving crimes during Easter. Publishers churn out series of books known as "Easter Thrillers" or "Påskekrimmen". Even the milk cartons change during the Easter season to have murder stories on their sides! "Pääsiäinen" in Finland is celebrated with Easter egg hunts for the children. The hard boiled, chocolate, or candy eggs are hidden in the house or garden. Children also walk between houses, handing out twigs or decorations in exchange for a few coins. In Denmark, there is a unique "Påske" tradition of sending teaser letters with little poems anonymously on Valentine's Day. If the recipient guesses who sent the poem, he or she receives the reward of an Easter egg. In Sweden, children dress up as Easter witches with long skirts, colorful headscarves, and painted red cheeks. They go to neighboring houses presenting drawings in hopes of getting sweets in return. Folklore says the witches fly to "Blåkulla" (Blue Mountain) to meet the devil. Another "Påsk" tradition is to place feathers on small branches of willow or birch in a vase. 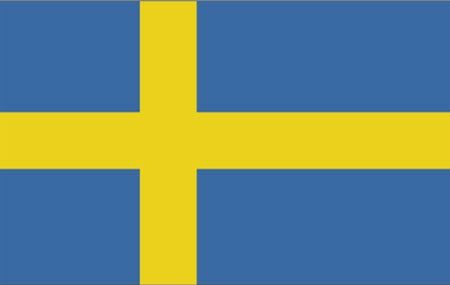 Submit your Cleveland Swedish organizations and resources. Submit your Cleveland Swedish jobs, classes and other opportunities. Submit your Cleveland Swedish Feedback and Memories. Tell us about the music, food, holidays, traditions, costumes, language and other qualities that make Swedes so special. A military power during the 17th century, Sweden has not participated in any war in almost two centuries. An armed neutrality was preserved in both World Wars. Sweden's long-successful economic formula of a capitalist system interlarded with substantial welfare elements was challenged in the 1990s by high unemployment and in 2000-02 by the global economic downturn, but fiscal discipline over the past several years has allowed the country to weather economic vagaries. Sweden joined the EU in 1995, but the public rejected the introduction of the euro in a 2003 referendum. 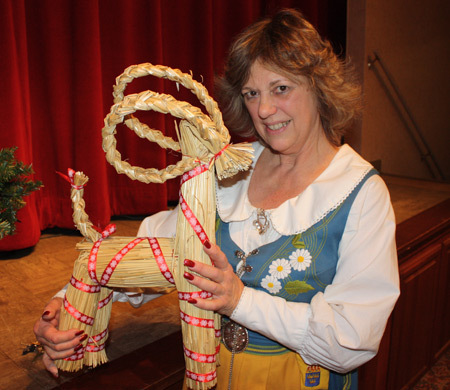 Submit your Cleveland Swedish cultural items. Read more about the Swedish and other Ambassadors. If you are interested in being considered to be an official ClevelandPeople.com Ambassador to the Cleveland Swedish community, please contact us. If you want to reach the Scandinavian community in Cleveland and Northeast Ohio, please contact us.